BMW Group India has reported its highest-ever first quarter sales (January-March 2019). All three brands – BMW, Mini and BMW Motorrad – are on a strong growth track from the start of the year. In Q1 2019, BMW Group India delivered 2,982 cars (BMW + Mini) registering a year-on-year growth of 19 percent as compared to Q1 2018. BMW India sold 2,822 cars (+19%) and Mini India sold 160 cars (+18%). These results come on the back on a strong performance in CY2018, when BMW Group India sold 11,105 vehicles (including Mini), registering 13 percent year-on-year growth. In Q1 2019, the 5 Series and the 6 Series Gran Turismo have contributed strongly to BMW India sales. The carmaker also saw a significant contribution coming from the locally-produced X range with introduction of the all-new BMW X4 Sports Activity Coupe that created a new segment in the luxury car market and generated new demand. The Mini Hatch and the now locally-produced Mini Countryman together commanded a share of over 80 percent in Mini sales. BMW Group Plant Chennai locally produces 10 car models –3 Series, 3 Series Gran Turismo, 5 Series, 6 Series Gran Turismo, 7 Series, X1, X3, X4, X5 and Mini Countryman. In 2019, the plant will also start local production of the X7. BMW dealerships also display the X6, M2 Competition, M4 Coupe, M5 Sedan and X5 M which are available as completely built-up units (CBU). At present, the Mini model range includes the Mini 3-door, Mini 5-door, Mini Convertible, Mini Clubman and the locally-produced Mini Countryman. Mini has established eight sales outlets in India. Meanwhile, strong demand for its range of products saw BMW Motorrad India sell 597 units. The sub-500cc motorcycles – BMW G 310 R and BMW G 310 GS – drove demand and accounted for over 80 percent of Q1 sales. The recently launched BMW R 1250 GS and BMW R 1250 GS Adventure are also seeing high demand from motorcycling enthusiasts. BMW Motorrad officially started its operations as a part of the Indian subsidiary of BMW Group in 2017. 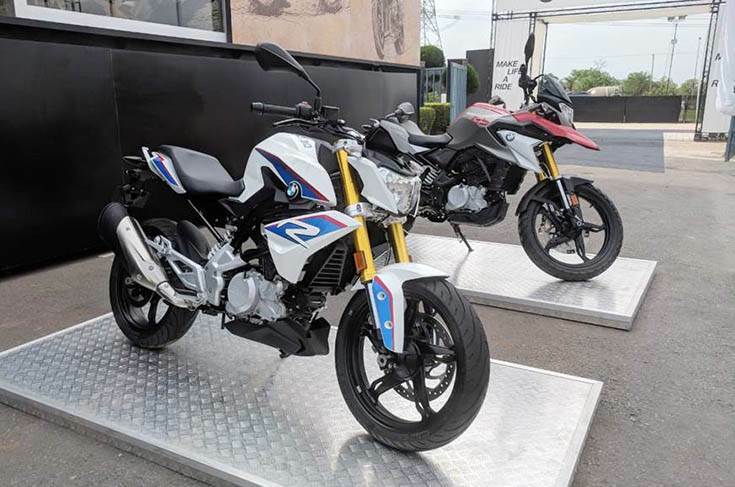 The BMW G 310 R and BMW G 310 GS have been developed in Munich, Germany by BMW Motorrad and are locally-produced by cooperation partner TVS Motor Company in Hosur, India. The range of BMW Motorrad motorcycles available in India as completely built-up units (CBU) include: Sport –S 1000 RR, R 1200 RS, HP4 RACE; Adventure –R 1250 GS, R 1250 GS Adventure, S 1000 XR, F 750 GS, F 850 GS; Roadster – S 1000 R, R 1200 R; Heritage –R nineT, R nineT Scrambler, R nineT Racer and Tour –R 1200 RT, K 1600 GTL and K 1600 B.